A PROSTATE CANCER DIAGNOSIS NOW WHAT? ARS‐Q1 A 55 – year – old man is found to have a serum PSA of 3.6. The next step in assessment is: A. B. C. D. E.
Prostate Cancer Screening RCTs: Two important studies—two different results? Prostate‐Specific Antigen (PSA) Testing in Participants without Baseline Screening Contamination in the Control Group of PCLOTrial. Shoag JE et al. N Engl J Med 2016;374:1795‐1796. Schroder et al., Lancet. 2014 Dec 6;384(9959):2027-35. 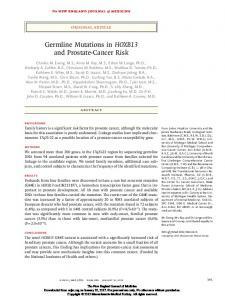 Family history of prostate cancer. African American ethnicity. von Hippel‐Lindau syndrome. Baseline serum PSA. Digital rectal examination. Baseline serum PSA A baseline PSA between ages 45 to 50 is a very strong predictor of the future risk of prostate cancer, more so than family history or ethnicity. Those who carry BRCA1 or 2 mutations are at an increased risk as those with Lynch syndrome (mismatch repair gene mutations). DRE actually adds little to early detection compared to serum PSA testing alone. VHL syndrome is associated with clear cell renal cancer and pheochromocytoma. ARS‐Q2 A 45 – year – old man is found to have a serum PSA of 1.3 ng/ml (confirmed). DRE is normal. The next step in assessment is: A. B. C. D. E.
Serum PSA at age 50. Serum PSA in 1 to 2 years. Free/total PSA. Multiparametic (mp) MRI. Prostate biopsy. Answer: B A baseline PSA between ages 45 to 50 is a very strong predictor of the future risk of prostate cancer. The median PSA in this age group is 0.7 ng/ml. This patient’s PSA is above the median and he should be re – tested in 1 to 2 years. 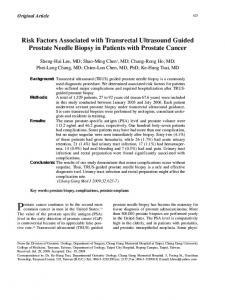 There is no evidence to support a biopsy at this PSA level (as opposed to a cut – point of 2.5 to 3 ng/ml). Similarly, mpMRI has not been validated to improve outcomes at such levels. 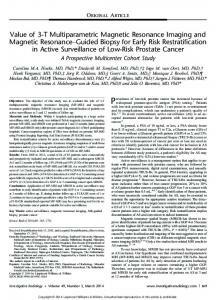 Report "Prostate Cancer Diagnosis and Risk Assessment. Disclosure"